In this video, we’ll show you how to use your DAW’s high-quality reverb in Element Control’s low latency mixer. We all know the story – you’ve finished your backing track masterpiece, your DAW buffer set to its highest setting, and now its time to overdub the singer. To overcome the higher latency that occurs with a high buffer setting, you’ve set up direct monitoring through Element Control. What’s the first thing every singer asks for? Reverb. To get started, let’s assume you’ve created a track in your DAW onto which to record a vocal. Next, set up a reverb send from this track to a separate reverb return using your favorite plug-in. Since software monitoring is turned off, the reverb send isn’t active when the track is in record, but is active during playback. So this is all you need to play back your recorded track back with reverb once its recorded. But how to hear reverb while you’re recording? First, let’s create an Aux input in your DAW to accept the Element FX Send input and route it to the same reverb send used for the initial track. The output from this channel isn’t needed, so set it to No Output. 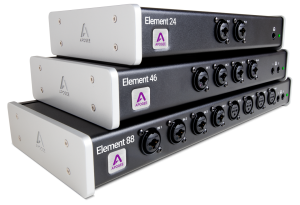 In Element Control, raise the FX Send fader on your vocal input channel, plus the FX Send Master. The mic input signal is now routed directly to DAW reverb input, while the reverb output is mixed with other playback signals and returned to the Element Control mixer. With this simple setup, you’ll be tracking those critical vocals with virtually no latency and the highest quality reverb.